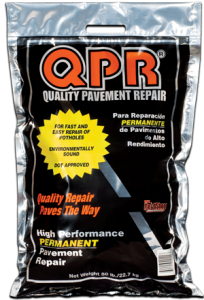 QPR is a permanent repair for asphalt and concrete roads, carparks, driveways and footpaths – a long term, once only repair application backed by the QPR Performance Guarantee. QPR is not a patch nor should it be compared to standard cold asphalt. QPR is a pre-mixed, high performance cold mix material that resists rutting and provides excellent bearing strength. By remaining pliable after application, QPR eliminates voids and crevices through continual compaction. QPR is ready to use straight from the bucket, bag or bulk bag. Just pour it into the damaged area, compact and it’s ready for action. The repair can be opened to traffic immediately. Suitable in in all weather and climates, QPR adheres to steel and concrete and can even be used in water-filled potholes. Its tenacious binder and adhesion properties make it far more effective than traditional cut-back or emulsion cold mixes, with a slightly flexible finish to prevent cracking. The prep work and subsequent clean-up associated with hot asphalt is no longer necessary. QPR is environment and OHS compliant, non-hazardous and won’t leach into surrounding storm water. QPR is manufactured in Australia for Australian conditions and distributed in Queensland by SEALS Brisbane Pty Ltd.